Everyone knows that hot dogs are only partially cooked and that you have to finish cooking them yourself. What most people don't know is the same is true for salami. I would go so far as to say that sticks of salami sold in stores are disgusting if you didn't properly "cook" them. When you buy a salami, it has a string attached at one end, it's there for a reason. After you buy a salami, you first need to take off the outer plastic casing and wash and dry the salami. Next, find a place to hang it. The temperature doesn't really matter, the only important thing to remember is that no part of the salami should be touching anything. The minimum aging time is three weeks. There is no maximum, I had salami hanging as long as two and a half months. I prefer to age the salami for five weeks. I have a meat slicer for cutting the salami, if you don't have one, don't hang it longer than three weeks. Even after only three weeks, taking the inner casing off can be a problem. It comes off perfectly on Aaron's pepperoni, but with Aaron's regular salami, it's a nightmare. The best way to get the inner casing off is with boiling water. Boiling water has to be poured over the whole length and circumference of the salami. Immediately after, cut off one end and start peeling. I like to use a napkin to get a better hold and instead of peeling the casing off in one winding strip, try to slide the whole thing off like a sheath. 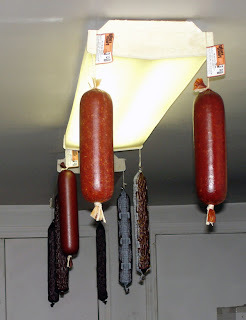 What you see in the picture is five Aaron's beef salami, one Glatt Mart garlic salami, one Glatt Mart hot Italian salami and one Glatt Mart Polish style salami hanging enticingly on two light fixtures. Glatt mart has a sale now, everything except buffalo, $4.99/lb. After watching Welcome to the NHK (NHK ni Youkoso!) I was looking all over for a Pururin ringtone. I was able to find a very low volume midi version. After using that for a few months and hearing caramelldansen, I decided it was time to switch ringtones. I found the ringtone on Myxer, downloaded it, installed, then decided to checkout Myxer itself. While I was downloading caramelldansen, I noticed an option to create your own ringtones. I created an "Artist" account. Uploaded the song and created the ringtone that I couldn't find. If you're reading this because you were looking for that ringtone too, enjoy.